Mayoral candidate London Breed apparently has no patience for public records requests or the task force that oversees them, and on Wednesday, the Sunshine Ordinance Task Force asked the District Attorney to step in. In the letter, the Task Force requested that the District Attorney enforce the law that says Breed must turn over public records and appear at their meetings. Breed, who did not respond to requests for a comment, is president of the Board of Supervisors representing District 5. She served as Acting Mayor following Ed Lee’s sudden death in December, and announced her candidacy for mayor in early January. “The lack of a letter is an indication of a lack of leadership in open government and transparency,” said Bob Planthold, a former Sunshine Ordinance Task Force Member and former Ethics Commissioner, explaining that in her absence she could have at least notified task force via written communication. The 7-0 vote to involve the District Attorney (with three absent and one chair vacant), was taken at a meeting on April 4. The vote, Planthold said, made a big statement. “That in itself is pretty alarming and damning,” he said. Breed has failed to turn in records some six times between 2015 and 2017, according to the letter. After failing to turn over public records, Breed snubbed the Task Force as well — failing to appear 10 times to explain why she has ignored records’ requests. Five of those failures appear to be connected to her failure to release her Twitter block list, which the task force deemed a public record. “It’s incredibly frustrating,” Maass said, noting that it is disheartening to see someone as powerful as Breed not lead by example when it comes to Sunshine requests. The Sunshine Ordinance went into effect in 2000 and, like other United States public records laws, it ensures government transparency and accountability. “There is no feeling that (her) office has to be accountable,” he said. It’s unclear what the District Attorney will do. The office did not immediately respond to requests for comment. “The hope is that the DA will look at it and raise the issue with the office, and they’ll take the DA more seriously then they took us,” Maass said. The requester whose complaint broke the camel’s back? The notorious City Hall gadfly and pigeon poop crusader Michael Petrelis. “There are many reasons why we should know what’s on her Twitter,” Petrelis said, noting that Breed uses the account to discuss city business. “She is a sunshine foe,” he said. And, yes, Petrelis was on her block list. Nonetheless, the task force found Breed’s failures to appear serious enough to send the letter to District Attorney George Gascon. Their other option was the State Attorney General, per the Sunshine Ordinance. Maass said the Task Force felt it appropriate to send to more local law enforcement. “She is in effect denying the jurisdiction and validity of the task force,” Planthold said. Without knowing the specifics of the case, Planthold said that in theory, Breed could have sent a representative who left before the item was heard. If that was the case, he said, she could have sent a letter explaining the absences. He also talked about the District Attorney’s responsibility. “It says a lot about their temperment in general, particularly if they’re running for mayor and saying they’re qualified for mayor,” he said. The last time the District Attorney stepped in at the request of the task force was in 2017, for a violation of the Brown Act by the Ethics Commission. In recent years, however, it has not had to ask for help from the District Attorney to enforce public records requests from an elected official. 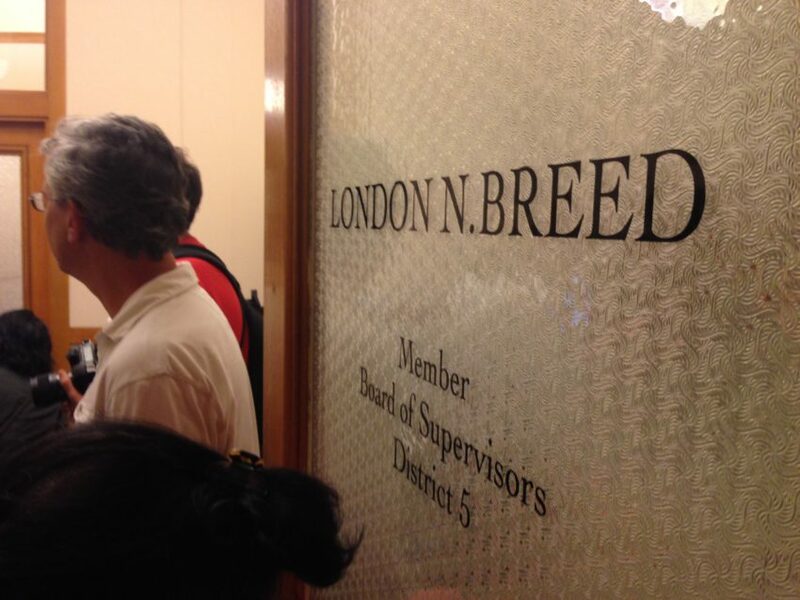 Larry Bush, who in the 1990s played a big role in forming the Ethics Commission, said that Breed was the lone dissenter in a 2015 Board of Supervisors vote on legislation that required supervisors to publicly disclose their appointment calendars. “In general, her record on the board was that she did not support open government,” he said. Bush noted, too, that Breed has been “less-than-compliant” with city ethics rules around the election. He cited Breed’s campaign illegally posting campaign ads on Muni bus shelters as one example. NextThe Hot Seat: Is Chief Bill Scott reforming the SFPD? It is sad to me what has happened to San Francisco. And even more so how off base the polls are for the Mayoral race. Justice will come- it always does. In this case someone who cannot be bought- and that is Angela Alioto. You will see and when she wins hopefully she will forgive all the basis press- But thank you for this article. My question would be why isn’t the Chronicle covering this? Because they endorsed her- and they bought by we will call – Mr. Twitter?